Bonn, Germany – Norbert M. Doerner today released NeoFinder 7.3, the third major update for NeoFinder 7. The new version adds more than 60 new features and enhancements, and is the most massive new version 7.x yet. The Gallery View shows photos in beautiful size, while keeping a list of the other items in the folder underneath it for navigation. The Display Filter allows to see only files of a certain kind, or name, label, or rating. Based on a lot of on-site feedback from clients, things like the cataloging of email contents have been added, or the search for duplicate folders. * NeoFinder now has a Display Filter that you can use to filter items based on their kind, name, rating, label, or other attributes! That is highly useful when working with large amounts of data, and works in all five view types! * NeoFinder now has a cool Gallery View! Not just in macOS Mojavo, like Apples Finder, but in all Mac OS X and macOS versions since 10.7! * You can now update one or multiple media files in an existing catalog! * Find Duplicates can now find Duplicate Folders! * NeoFinder catalogs Affinity Publisher documents, and of course allows you to edit the whole set of XMP metadata for these, too! * You can now download an entire folder with all files and subfolders from the Backblaze B2 and a Dropbox catalog! * Please note: This will be the last NeoFinder version to support Mac OS X 10.7. If you still use that old Mac OS X, please check this NeoFinder version very carefully, and if anything doesn’t work for you, please let us know immediately! * Cataloging – NeoFinder catalogs metadata of songs, movies, fonts, and photos, including the MP3-Tags of several audio file formats, EXIF, GPS, and IPTC data of photos. NeoFinder also edits Adobe XMP data, including keywords. All these are arranged clearly in the user interface, and can be extensively searched. For numerous photo and video formats, fonts, text files, and even audio files, NeoFinder generates thumbnails during cataloging, displaying them in all list and icon views. 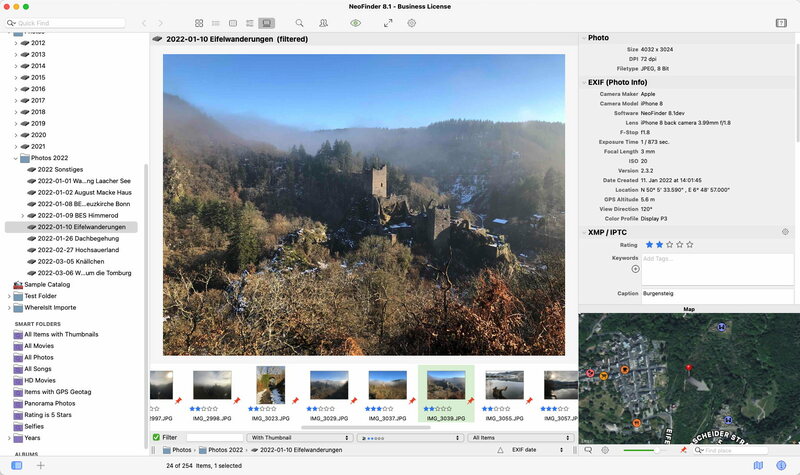 * Managing Metadata – The built-in XMP metadata editor with presets can edit and add keywords, ratings, descriptions, copyright information, and more to photos and videos. * Mobile – Keep your NeoFinder database with you on your iPhone or iPad with the separate NeoFinder for iOS app. * Integration – Offering a tight connection to major productivity tools, such as Adobe Creative Suite, Microsoft Office, Roxio Toast, FileMaker Pro, Apples Spotlight and Finder, and the extensive support of drag&drop into other applications, NeoFinder can support many workflow scenarios. The AppleScript support in NeoFinder allows custom integrations of all kinds. * Geotagging – Only NeoFinder offers the integrated GeoFinder, which searches for photos taken near a spot, or the KMZ export for coordinates and photo thumbnails as a way to give geolocated photos to friends. NeoFinder can even geotag photos itself, no other software needed. And only NeoFinder displays important facts about any geolocation in the truly unique Wikipedia Inspector. * Since the initial release of CDFinder 1.0 in 1996, more than 85,000 customers in 101 countries around the world are using CDFinder and now NeoFinder to organize their digital library, and manage their data archive and backups, including NASA, IKEA, BBC, Mattel, Rand McNally, Pfizer, Random House, Oracle, and Warner Bros.
NeoFinder 7.3 requires Mac OS X 10.7 or later (Mac OS X v10.7 thru macOS High Sierra 10.13). Previous CDFinder and NeoFinder versions for older Mac OS versions are still available. Separate app for iOS (iPhone and iPad) is available. NeoFinder 7.3 is a free update to all NeoFinder 7.x users. NeoFinder 7.x is a paid upgrade to licensed users of NeoFinder 6.x and the old CDFinder, upgrade price starting at 19 Euros. The price for new users starts at 29,00 (EUR). Multiple user packs are available for network users. Cross-grades for users of similar applications (Cinematica, DiskLibrary, FileFinder, CatFinder, Canto Cumulus, Disk Tracker, DiskCatalogMaker, Atomic View, iView Media Pro, Extensis Portfolio, and others) are available. A free NeoFinder demo version can be downloaded from the NeoFinder website. Norbert M. Doerner is a computer scientist with a love for integration and cool products. He develops great Macintosh software since 1991. Popular products include the disk cataloger NeoFinder (was CDFinder), various plugins for the Finder, iPhoto and Aperture, and the audio transcription software F5.app. All Material and Software Copyright (C) 1991-2018 Norbert M. Doerner. Apple, the Apple logo, Mac and Macintosh are registered trademarks of Apple Inc. in the U.S. and/or other countries. Other trademarks and registered trademarks may be the property of their respective owners.